Spirited performances of toe-tapping tunes can't overcome a clumsy script. 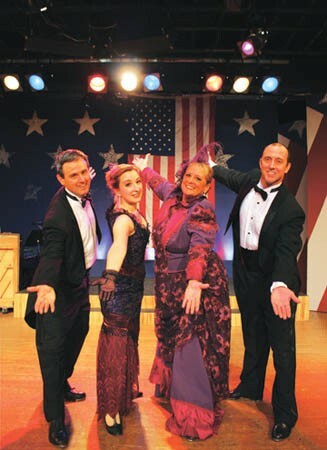 Give their regards to Broadway: George M!, at The Theatre Factory. The cast in The Theatre Factory production of the 1968 juke-box musical George M! does George M. Cohan's grand old songs proud, singing and dancing with polish and spirit, with lots of infectious tapping footwork. Unfortunately, neither they nor director Jeremy Czarniak do much to get the clumsy book to work. Czarniak is also constantly front and center as Cohan himself, and having multiple big tasks probably didn't help. While offering good performances of 26 songs, everyone remains stuck with the glue that is supposed to hold the whole package together. Most dialogue sounds like banter, and juxtapositions of scenes and songs rarely underscore each other. The script, by Michael Stewart and John and Francine Pascal, skips through events covering about 60 years of Cohan's life -- a life, according to legend, which was the theater. You mostly see Cohan getting himself and his family into bigger and better careers with him as star, playwright, songwriter, manager and producer. The program book defines 17 scenes, but that structure doesn't clarify why people behave as they do, or even sometimes what is actually happening. Moreover, except for George the characters have virtually no personalities, to which most of the performers add nothing. The script makes it clear, repeatedly, that George M. was a pushy show-off and wise guy. Czarniak does that well and makes genuine a later, serious scene when an aging Cohan had become overshadowed by newer stars on Broadway -- a development that unexpectedly ends the show on a dark note. Czarniak dances expertly, but his singing sounds more serviceable than special and he delivers most dialogue like throwaway telegrams rather than meaningful sentences. The best singing comes from Leah Fox, who makes "Mary's a Grand Old Name" live again in beauty. Also, Jon Cannard gives substance to several supporting roles as impresarios, even without variety of interpretation. Meanwhile a couple of young men in the cast discredit the production by not pulling up their pants and tucking in their shirts; Czarniak himself could stand help with his drooping tux. Evidently Cohan had class and pizzazz, and he certainly wrote memorable and charming songs. Unfortunately this weak take on the rest of a shallow show fails to make his story engaging.